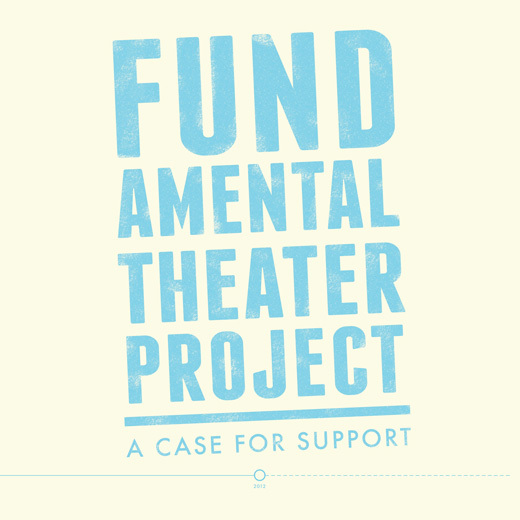 Fundamental Theater Project is a not-for-profit company based in New York City. They approached me to do a last-minute design for the cover of a brochure booklet they had put together to distribute at an upcoming fundraising event. They wanted to emphasize the "Project" part of their name—i.e. the works-in-progress, staged readings, developmental workshops—without seeming too amateur or "arts-ands-crafts-y." Their managing director mentioned off-handedly that they wanted to lay out a timeline of their project so far on the inside of the booklet. This became a key graphic element on the cover. The timeline starts on the back cover with their founding in 2010, and travels across the fold to the front cover where the present, 2012, is front and center. A dashed line continues toward the inside of the booklet, representing both future plans and the need for support to achieve them—the message of the brochure.